Granite Getaway is a 4-player Minigame in Mario Party 6. This minigame is based on the iconic Indiana Jones scene in which Indy was chased by a giant boulder. Everyone is looking around wildly, then the boulder drops from the ceiling, and the game starts. The players must run away from a giant rolling boulder behind them. The players have to hold down the whole time or they are squished by the boulder. Players have to jump to avoid the many obstacles that appear on screen. 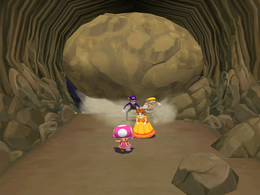 After a while, a spot with a wooden floor is reached and the boulder falls through; players who survive up until this point win. When the players get to the end of the cave the boulder drops and the winners do their victory animation. Rules – "Run away from the massive rolling boulder! Whoever reaches the goal without getting squished wins!" Advice – "Jump over obstacles or you'll trip over them." This page was last edited on December 18, 2017, at 09:42.